BY Gina Ciliberto for FORDHAM NEWS ON NOVEMBER 29, 2018 . As Camesha Grant walks through the dining room of the Community Kitchen and Food Pantry of West Harlem one autumn afternoon, she is met with boisterous greetings from a group of women awaiting a hot meal of roasted chicken with green beans and pie.“Look who’s here!” a gray-haired woman beams at her. Grant is the vice president of community connections and reach for the Food Bank for New York City, which seeks to connect the one-in-five New Yorkers who face food insecurity each year to long-term, sustainable ways to end hunger. This means providing 60 million free meals per year citywide, plus a range of other services, including free tax counseling and assistance with enrollment in the Supplemental Nutrition Assistance Program (SNAP). Her job is to build partnerships citywide to help people live independently and help families have security around food. But at the heart of her work is the human connection, the kind she fosters in this dining room. Camesha Grant in the pantry at the Food Bank’s West Harlem location. Grant joined the Food Bank as a senior director in 2013, after working 17 years in foster care at the city’s Administration for Children’s Services (ACS). During that time, she earned master’s and doctoral degrees at Fordham’s Graduate School of Social Service, and served as an adjunct professor at the school for nine years. As she worked on family reunification cases at the ACS, she learned that a lack of access to food was often equated to neglect. “I thought it was criminal to have families be at risk of losing their children because they couldn’t afford to feed their families,” she says. The realization struck a personal chord. A native of Rockaway, Queens, Grant grew up in a single-parent household. Her working mother used food stamps to help provide for Grant and her younger brother. 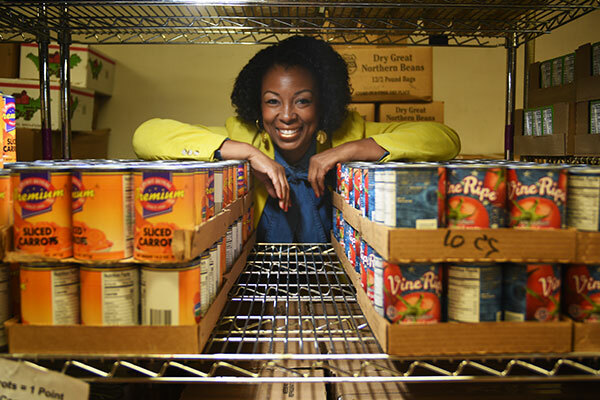 “I didn’t know anything about food banking [when I worked at the ACS], but I knew a whole lot about food insecurity—and I knew how to connect with people and how to problem-solve around what they need,” she says. Under Grant’s lead, the Food Bank has installed food pantries on 11 campuses of the City University of New York and in probation offices in all five boroughs. She also oversees a health education program in more than 200 low-income public schools that trains teachers to implement nutrition education lessons. The Food Bank also operates campus pantries in more than 40 low-income public schools citywide. Yet her proudest achievement harkens back to her focus on children and families. Last year, she founded a food pantry at an ACS office that now also stocks clothing, diapers, books, toys, and other items for children and babies. She is currently working with ACS to install more food pantries at ACS locations across the city. “To be able to focus on my love and passion for children and families and create partnerships to serve those families during some of the worst times they experience, it’s a joy and a victory,” she says. At the Food Bank, Grant is a leader. In the community kitchen dining room, she prefers to be seen simply as a friend to the people she serves.